Three days ago, I took a ride in a car powered purely by the sun. First of all, I had wanted to ride in a Tesla car for years, but I never seriously thought it would happen, at least not this soon. I didn’t even put it on my vision board, but I had reflected (more than once) that it sure would be great to experience a pure-electric vehicle firsthand. It all started out predictably enough. I stuck out my thumb as I so often do these days to get up to the nearest grocery store. In a few minutes, I was riding in the back of a covered truck heading northwest toward Pahoa-town. Behold my day: I am standing on the side of the highway, Hawaiian sun beating down on my brow, carrying a backpack of foodstuffs, holding out my thumb, exposing the fact that parts of my arm are still hilariously pale. Although I’ve been told this actually helps me when hitchhiking, no one seemed inclined to stop for me that afternoon, and I began to walk back to main street. Perhaps someone would pick me up and take me to the south of town to a better spot. Perhaps. And so I stood after a popular intersection, in a place I have many times before, and stuck out my thumb. In faith. Hmm. People seemed disinclined today. Perhaps I wasn’t smiling confidently enough? Perhaps my body language wasn’t great? No, that wasn’t it. I just had to be patient. I took a breath and projected a welcoming vibe. Was that a—no, they wouldn’t be… out here? Yep, it was definitely the stylized T logo of Tesla Motors, Inc.
Wait—no. No way. It’s not. It’s stopping!? 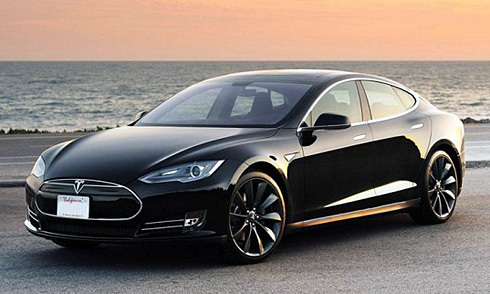 I could hardly believe my eyes when a black Tesla Model S pulled over in front of me and stopped. I looked down to the door and was immediately flummoxed. Where a handle ought to have been, there was only an inlaid silver bar. There was nothing to grab onto at all… until the bar popped out and became a door handle. Around this time, I realized that astounding things were happening. As I sat down, several objects entered my mind at once: the driver, an older and quiet man; the unique curve of the dashboard; and the large screen that dominated it’s center, relaying all manner of data, including a running graph of the car’s efficiency and a projection of milage remaining. The driver soon explained that it was a giant touchscreen and was fully programmable. At this point, I felt as though I had entered a small pocket of accelerated time. Perhaps the 2050s already existed, if only inside of this car. The driver was gracious enough to answer several of my (several hundred) questions about the car. And as he accelerated from 30mph to 70mph in the space of a few seconds, I began to realize the true power of such a machine. Not to mention the beautiful quietness of the car that the all-electric design allows. The electric motor is even used as a generator during braking to recharge the batteries. And then the driver dropped the bombshell—at least for me. “We’re running completely on solar power, you know,” he said to my infinite delight. I wish I would’ve had time to talk with him more, but the efficiency of the machine had backfired since we had arrived at my destination much faster than I had anticipated. He pulled over to my stop, and I found it difficult to leave. He said he had to go. “Of course,” I said, and thanked him for the ride. It had happened. The Universe had granted my request, and I was still slightly stunned at the experience. I had ridden in a Vehicle of the Future. Truly. I stepped out and watched a pitch black Tesla Model S zip into the distance with an odd quietness. In just a blink, this incredible car had entered my life, and now, with another blink of my eyes, it had vanished into the trees. That is so cool! I love our Nissan Leaf, but I’m very curious about the Tesla. Sounds really well-designed. What a fun experience!